Each car had its strengths and weaknesses, so declaring a winner was fairly challenging, though a clear loser was evident from the start. Continue reading to see how the cars performed in the various categories. While exterior styling is subjective, the clear winner in this group is the Mazda 6. Bringing a concept car to production often results in the radical styling getting tossed in favor of something more inoffensive, but Mazda has managed to carry the concept cars gorgeous looks into production. Ford, following a similar vein, have brought us a family sedan that is a doppelganger for the uber pricey Aston Martin. Kia just edges out the Honda here with an edgier look while the Passat's clean, but boring appearance trumps the Altima's amorphous blob of a sedan. When looking at the interiors, we must consider not just the design, but the ergonomics, comfort, material quality, and overall use of space. On this front, the Accord and Mazda 6 come in extremely close to each other with the Accord's slightly better ergonomics. The Passat, despite its aged design, gets high marks for quality feel. Ford's Fusion, while one of the newest designs with tons of gadgets, loses out for its mediocre interior material quality. Kia's interior is actually decent, but in this group, it gets dinged for design and ergonomics that cannot quite compete. 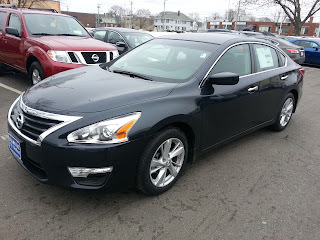 And once again, the Altima brings up the rear for a combination of mediocre ergonomics with terrible material quality. Honda, as an engine company, owns this category, especially because of the excellent manual transmission in the Accord Sport. The 6 is edged out by the Accord in part because the manual transmission is not yet available on the Touring model until later this year and the engine note is so quiet as to be virtually non-existent. The Fusion, with its small turbocharged engine, leads this pack with not just strong power delivery down low but also a nice induction note, though loses out because of the lack of a manual transmission. While it runs out of steam higher up in the rev range, in daily driving, one would hardly ever notice it. Kia's motor offers the best power of this group but good luck finding one with a manual transmission. The Passat's 2.5L 5-cylinder feels so flat and characterless that it falls to 5th place, with the antiquated 5-speed manual transmission doing nothing to help it out. No surprise, the anemic Altima once again plays the caboose with its horrid CVT. This one is a particularly difficult category to address because what is most important here is balancing good handling with ride quality while providing good feedback through the steering wheel without making it difficult to drive in day-to-day traffic or on long trips, but still keeping everything fun for the enthusiast with a family. Honda has managed to capture the essence of this well with the new Accord. The handling is very capable, but the ride quality remains comfortable and the steering provides decent feedback and good precision. The 6 gets edged out largely because of ride quality, which is stiffer than the Accord, but exhibits handling and steering that is just as good as the Accord. The Fusion and the Optima felt very similar and both give up some handling prowess to the Accord and 6, with the Fusion edging out the Optima slightly due to its better damping. VW places low in large part because the steering is so floppy and lifeless, though the handling is not off the mark with the rest of the group and ride quality is very good. Once again, the Altima plays the anchor with its combination of harsh ride, numb lifeless steering, and only average handling. NVH is an area that will be important to the buyers of these cars and the Mazda 6 does the best job of handling all of this. It was easily the quietest car, in part because the engine is so quiet. The Passat also does an excellent job of managing NVH. The Accord and Optima both exhibit more road noise than the front runners with the Accord managing it ever so slightly better. The Fusion loses major points here for its poor management of wind noise at highway speeds. The Altima, not surprisingly, comes up last once again, the result of lots of road noise entering into the cabin and an incessant buzzing from a vibrating trim piece. An important part of vehicle ownership decisions these days, gadgets are often the make-or-break deciding factor for many buyers. All of these cars have the basic requirements of bluetooth phone connectivity and hands free calling, but from there, Ford takes the cake with its TFT instrument panel and MyFord Touch center console. The Mazda 6 follows close behind with its center console touch screen, multimedia control knob, and standard blind-spot monitoring and back-up camera. The Accord also has a center console screen, though it lacks any additional gadgets to set itself apart. A surprise is that the Nissan Altima ranks higher here with its fancy instrument cluster panel and small center console display. The VW loses ground here for its lack of a back-up camera, which all of the first 4 competitors have, and the Kia brings up the rear with its complete throwback to simplicity. lowest as tested price of all of the cars here. Value for money will play a big part for many buyers in this segment and the Honda Accord is hard to beat here. It offers a lot of car for a reasonable price and has well thought out option packages allowing you to pick the one that best fits your needs. Mazda has done a great job packaging the 6 as well with much more standard equipment, but fewer packages and more individual options to tailor the car to your desires. The Fusion offers a lot of car and a lot of gadgets, but has a complicated options arrangement and can be difficult to navigate with the price ramping up very quickly. 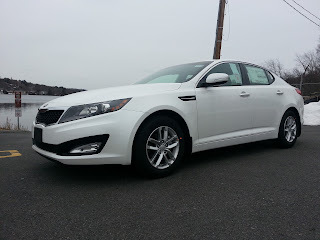 Kia does well here with a nice car that options well and offers a great value especially given the design, space, and performance. VW really needs to redesign the Passat or make it less expensive because at its current price, it is hard to justify given its lack of any sort of stand out character. Finally, the Altima, struggles to justify its pricetag with the terrible material quality, horrible driving experience, and miserable transmission. The 2014 Mazda 6 Touring sedan. With either a 1st or 2nd place finish in every category, this sedan presents one of the best values in the mid-size family sedan marketplace. It offers enthusiasts a decent engine, excellent chassis, comfortable interior, plenty of gadgets to keep the driver happy, and one of the most attractive exterior designs out there. While the Accord kept the race very close and actually took more 1st place categories, it struggles a bit with a slightly bland exterior design and NVH. The Fusion trails the two front runners by a fair margin, struggling a bit with NVH and interior quality. The Passat and Optima actually tie with both cars ranking very close in most areas, struggling mostly from inability to stand out in a group of strong competitors. The clear loser here the Altima, which loses every category except one. So at the end of the day, if we were to put our own money down, the Mazda 6 would be at the top of the list. The fact that the Touring model will be available with a manual transmission and a high-output 2.2L turbo-diesel is just around the corner makes it an increasingly attractive choice. For the enthusiast with a family, Zoom-Zoom is the way to go for a great looking car that delivers on performance, fuel economy, and, most importantly, driving dynamics.